As anyone who is into building and keeping reef complexes and aquariums knows, there are some fish that scream “I am an accomplished collector” to anyone who knows what to look for. 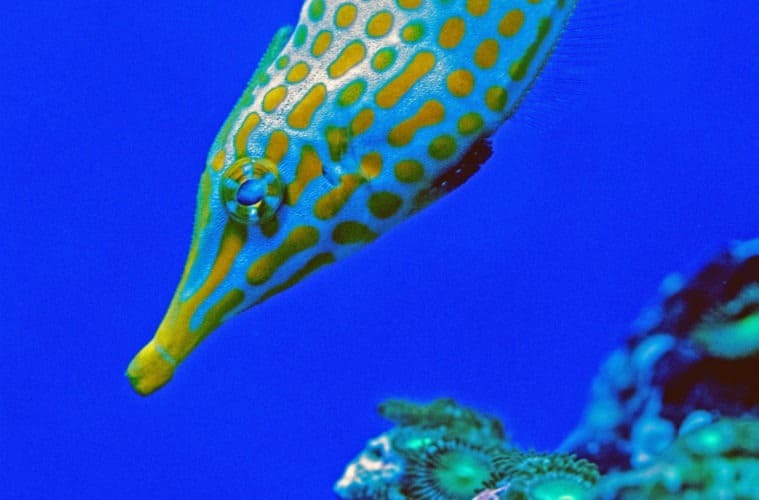 Intelligent and colorfully flashy fish are a symbol of status and taste, as well as really cool pets! There are few prices a really passionate fish collector will not pay if it means acquiring an extremely beautiful, extremely rare reef fish. And, as you will find out, there are some really pricey specimens swimming around in the sea. Are you planning on creating a new, incredible aquarium? Do you already have one and want to get ideas to populate it with wonderful creatures? Read on to find out which are the world’s 7 most expensive fish! This little beauty has a square, flat body speckled with silver-tipped dark blue scales. The fins at the back and the fanned tail are dipped in bright yellow, giving the fish a strikingly beautiful appearance. Its size, when it is fully grown, is 6 inches. In the wild, the Wrought Iron Butterflyfish lives in clear, wide waters to the south of Japan and around some Northern Pacific islands. While, in its natural habitat, it forms schools of over 10 fish, they are not so commonly grown in captivity. At $2,500, this little fish is one of the rarest and most expensive aquarium fish in the world! Long, orange body with thin white lines, a lovely fanning tail sporting a false blue eye— the Australian Flathead Perch is a supermodel! Like anything this beautiful, it is extremely rare. Its price reflects that: at $5,000, you need to want this little fish quite badly to find and buy it. The Australian Flathead Perch likes to live under rocks and reef caves in tropical waters. It hurries out to catch small prey such as ghost shrimp. They grow to be about 6 inches in length and are a serious trophy fish for any passionate aquarium keeper. This deep water dwelling little fish is, at $6,000, claimed to be both highly costly to buy and super rare. Its orange body is shaded in darker tones and has a unique pattern of white stripes all around. The Neptune Grouper can live from 260 feet to 800 feet, and it can reach 17 inches in length. They are hard to transport and keep because they have to go through a complicated decompression process to get them used to surface water life. Worth the effort, though: they are beautiful and have a strong— albeit somewhat grumpy— personality. At first sight, the Golden Basslet might look like just another orange fish, but— in truth— it is so much more than that. Its seemingly uniform color turns out to be, if you look attentively enough, an incredible combination of gradient tangerine and yolk yellow lined with gold and red. These honeycomb-patterned basslets are found in reefs at depths of 400 to 500 feet in Caribbean waters. At $8,000, the Golden Basslet (also known as Liopropoma aberrans) is rare and much sought after. It likes to live in sandy slopes or solitary caves from which they can ambush their next meal. This Cook Islands and Rarotonga inhabitant is, at $30,000, one of the most outrageously pricey fish in the world. This, however, does not stop passionate reef builders from trying to collect it! Shy and subdued, this Angelfish lives amongst the reef anything between 150 and 400 feet deep. It can grow to be just under 3 inches and is arguably too little fish for too much money. If you just aren’t deterred, consider that this angelfish is fussy and needs extra care (such as lots of supplements and perfect climate conditions) to stay healthy. Is it a retro rug? A party paper plate? No, it is the Freshwater Polka Dot Stingray! It also goes by the name of the Xingu River Ray, this creature is one of the rarest and— at a whopping $100,000— most expensive fish in the world. This stingray lives in the sandy bottoms of the Xingu River area in Brazil. The disc-shaped, polka-dotted body grows to be almost 16 inches in width, and it weighs 44 pounds! It has wonderful eyesight and also looks and hunts its prey (usually invertebrates) at night. At the daytime, though, it just burrows in the sand to rest. Sadly, this beautiful animal is endangered as its habitat gets destroyed or polluted. The Platinum Arowana is traditionally believed to bring good fortune and wealth to whoever owns them. However, if you get your hands on this $400,000 monster, chances are you are already pretty well-off! A freshwater fish, the Platinum Arowana glows with silver shine all along its textured body and elegant posterior fins— a truly unique appearance. There are not many in the world: the rarity explains the steep price. In the wilderness, this fish shoots out of the water to devour insects and even small birds. It is solitary and needs a large tank, as well as for you to provide activity. Overall, pricey, awesomely beautiful, and hard to keep. But— if you can afford it— so worth it! If you are a reef and aquarium aficionado, you are already frothing at the mouth to get one of these little creatures. They are all exotic, interesting, and perfectly good to adorn your aquarium with if you have the resources to do so. However, do remember that most of these fish are hard to get and keep, and need oh so much special care. If you are actually planning on taking the money out of your pocket to pay for one of these fish (and not just daydreaming), make sure that your lifestyle and time to care for it! Andy is an adventurer, fish enthusiast, and travel writer with a passion for anything and everything outdoors. His favorite fishing survival tool is the Leatherman Charge.